Anglona is on the hill, 263 meters high, where once the settlement was placed diPandosia, territory situated between the rivers Agri and Sinni that controlled the whole plain below (plain of Metaponto). 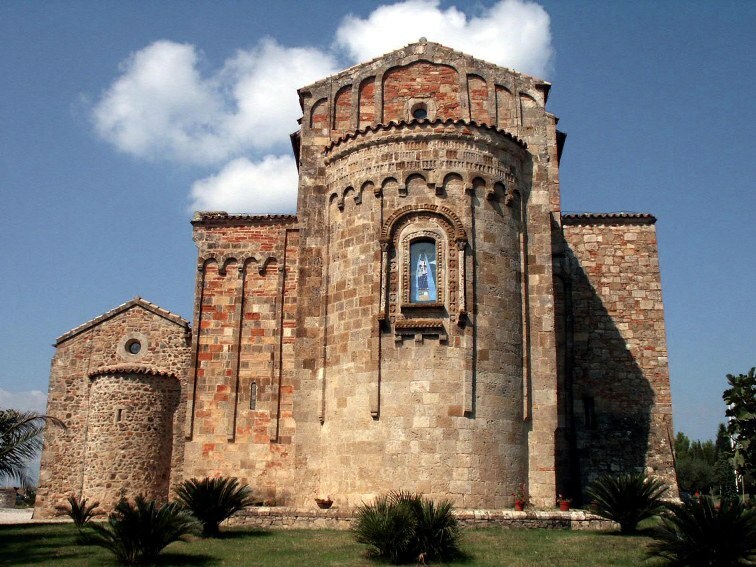 Completely outside the village of Tursi, the Sanctuary is Anglona place to the east of it and is about 11 km from the town. Various theories exist as to the etymology of the name Anglona. It 's possible that it comes from "clanius", indicating the flat or "Chiana", as they say today in the various dialects of neighboring countries. Another etymology derives the name Anglona from the Latin "angulus" or Sicilian "agnuni" the Course "agnone". It 's likely that the word derives from "agnone" or "lamb" which means river, in reference to the presence of the two rivers, the Agri and Sinni, flowing at the foot of the hill. On the origins of Anglona you have some news. Probably this is very populated because the inhabitants of Pandosia, since their city had been destroyed, moved to Anglona. Then the number of inhabitants increased even when Anglona became Episcopalian. There is no clear documentation regarding the origins of the cult to the Virgin and about the construction date of the oldest factory. Certainly the first construction dates back to a period prior to the year one thousand, conceivable around the seventh century or, more likely, to 'the eighth century, so his style may have been the first clear Roman mold. The present building was built around the 'eleventh or twelfth century. Extremely impressive is the portal that introduces inside the church, a clearly Romanesque. The bow front is tuff and is surmounted by bas-reliefs depicting the Lamb and the four symbols of the Evangelists. At the sides there are depicted the Apostles Peter and Paul. The interior has a Latin cross divided into three aisles by pillars supporting the right of the round arches and left of the arches. The most interesting testimony was given inside the church with exquisite decorations and frescoes that once adorned the walls with comletamente stories of the Old and New Testament and, on the columns, figures of saints. The church has been painted several times with white lime, for which the frescoes were repeatedly subjected to whitewash (cover with plaster). Now that you have completed the restoration work, you can see almost all the valuable paintings. In the nave depicts the cycle of Genesis, divided into an uninterrupted succession of scenes, designed in two registers. The pillars are some recognizable saints, all to be tied to popular devotion. It seems that these paintings belong to two distinct eras: those on the right side of the nave at 'the eleventh century, while those on the pillars to the fifteenth century. Confirmation that Anglona bishopric was in the past is clearly established by documentary evidence. In fact, with the name of Peter, in 1110, for the first time, we find mention of the bishop of Anglona. It 'possible that the bishoprics were two very distinct: that of Tursi, founded in 968, and the seat of Anglona, of which we know only in the second half of the twelfth century. This period was a flourishing city Anglona and powerful. In 1546 Pope Paul III with a bubble ordered to transfer the episcopal seat in Tursi at the Annunciation Church, stating that the bishops denominassero from that date "Bishops of Anglona and Tursi".